Alliance Building Solutions can provide you with a flat or pitched fibreglass roof replacement that will last a lifetime. We are proud to be able to offer our fibreglass roof replacement & roof installation service with its high quality end product to both residential domestic and commercial customers in Taunton, Wellington, Devon, Yeovil, Somerset, Bridgwater, Wiltshire, Dorchester, Dorset, Bristol, Gloucestershire, Weston-super-Mare, Exeter, Plymouth and Surrounding Areas. A correctly laid fibreglass roof, also known as GRP Roofing, should last for at least 40 years with no measurable deterioration in quality and performance. When we install a Fibre glass roof, they are completely waterproof, contain no seams or welds, maintenance free, and strong enough to be walked on. Our fibre glass roofing systems are available in a wide range of colours to compliment your home or building and can be installed in just one day which makes them the perfect choice for a fast and durable solution. GRP stands for ‘glass reinforced plastic’, the polymer glass resin is heated up and then applied to the pre-installed plywood rooftop surface. When the glass reinforced plastic then dries it turns incredibly hard, making it the best flat roofing solution due to its completely waterproof properties and high resistance to all weather conditions. What’s the history of GRP Fibreglass? Fibreglass was first formally discovered in the late 1940’s and then went on to be used in the 1950’s and 60’s for a wide range of applications because of its corrosive-proof properties. Allied with its crystal-like strength, high-sheen and seamless appearance, it soon proved to be invaluable for boat building. The uses for glass reinforced plastic have since widened to the extent that it now used as the standard material when fabricating small crafts, liquid tanks, cladding panels for buildings, roof light instalments and of course, high performance waterproof coatings for flat and even pitched roofs. Since the mid 2000’s, a rapid growth has become apparent within the UK roofing industry as more and more people realise the heard-wearing and cost effective benefits of GRP Fibreglass roofing. Why choose Alliance Building Solutions? We absolutely strive for 100% customer satisfaction every, single, time. When our roofing wisdom which we’ve garnered over the years is coupled with one of the strongest and best flat roofing products available on the market, tripled with our 25-year GRP Fibreglass Roofing Guarantee, there’s not much that can go wrong. What can go right however, is that you are left with a new fibreglass roof that is going to functionally last over 40 years without maintenance, is completely weatherproof, and looks great due to its high-shine, seamless finish. Contact Your Local Taunton Fibreglass Roofing Professionals NOW for a free quote! Prices start from just £80 per square meter! Because of GRP Fibreglass’s durable and flexible nature, its surface can also be fitted with wooden decking or ceramic tiles, providing further complement to your properties style whilst keeping the below building completely watertight. You can contact Alliance Building Solutions for a free in depth survey and report on your flat roof. This will be followed by a free, fully written, no obligation quotation. All of this is absolutely FREE, so don’t wait any longer to cure your flat roofing problems! 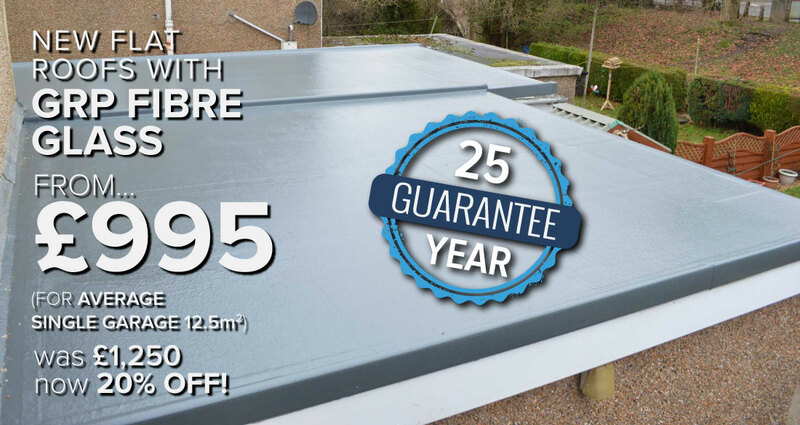 Our GRP Fibreglass Flat Roofing system comes with a fully written 25-year guarantee, for about the same price as an asphalt felt roof which usually comes with a 10 year guarantee. Fibreglass roofs really are the way to go if you have a flat roof, are thinking long-term, and don’t want to pay too much extra for the numerous added benefits! Although your new GRP roof is designed to be maintenance free, you may decide to wash it occasionally to maintain that ‘as new’ appearance. If it is safe to do so, the most feasible way to clean your GRP Fibreglass Flat Roof is by using a mop and bucket with warm soapy water, or cold water mixed with bleach. Alternatively, you can use a long handled brush combined with your garden hose if the roof has not been cleaned for a long period and has accumulated some hard to move stains. If you have one, another method is to use a pressure washer, but we would recommend that you do not use a hot steam pressure washer, because at certain high temperatures this can cause the plastic polymers to warp or deform slightly. If you’ve had any fibreglass steps, balconies or walkways installed, again a stiff brush with a garden hose, or a pressure washer, are both ideal ways for removing algae, mould, mud and dirt from the textured non-slip finish. Contact Your Local Taunton, Somerset, Devon & Bridgwater Roofing Services & Fibreglass Roof Installation Roofing Contractors NOW for a free quote!